A new Instrument for the Rapid and Accurate Determination of the Viscous Properties of Newtonian and Non-Newtonian Fluids. The Falling Needle Viscometer (FNV) consists of a metal or glass needle with hemispherical ends falling vertically in a fluid with its longitudinal axis along the axis of a cylindrical container. 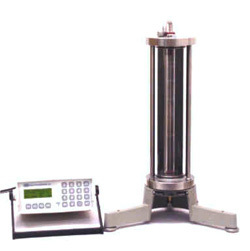 Also, the Controlled Needle Viscometer (CNV) consists of a metal needle with hemispherical ends and its top end is connected to the extension bar plus the weight holder. The CNV is the same as the FNV except for the needle dropped. A measurement of the needle terminal velocity allows a determination of the viscous properties and density of the test fluid. The falling time is measured automatically by means of Hall sensors and a magnet in the needle. The CNV comes with a small sample insert kit for those cases when the sample supply is limited. For Non-Newtonian fluid, a computer program is available from SBS. * Outside this range, consult SBS. **depends on the sample and system.